For all your boating needs . . .
Aftermarket Suzuki Water Pump Impeller. The impeller is an important part of the water pump and a vital piece of equipment to cool the engine and prevent seizing. It is recommended to replace the impeller on each annual engine service. PLEASE NOTE: Most outboard parts are specific to certain models & year series. And cannot be held responsible if you do not provide engine model and serial number with order We advise you to attach your model and serial number at the time of order to ensure the part is correct for your engine. Please Call 01252317100 With model and serial number for advice from one of our engineers on spares/parts for your engine. 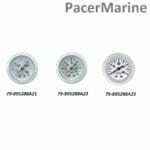 Pacermarine © 2019. All Rights Reserved.